My name is William Morris, my childhood and early years were spent in the mining town of Treharris, South Wales. At the bottom of Webster Street where I lived was the Deep Navigation Colliery and at the top of our street was the Salvation Army Hall. I joined the Royal Navy during the war and served for a time with Combined Operations in preparation for the Normandy Landing. A few days before the invasion I joined a crew of a converted Thames Barge which was loaded with high octane petrol, bound for the Normandy Beaches. The barge was moored at Itchenor, which is part of the Chichester Harbour. In the early hours of 6 June 1944 we set off from our mooring with an armada of small landing craft. We were directed to Gold Beach at Arromanches, close to the proposed siting of the Mulberry Harbour. I am unsure of the actual date but some time later we were caught in a severe storm and it became necessary to abandon the vessel. We were taken to a survivor’s camp run by the Royal Marines, at a field close to the ruins of the village of Arromanches. The barge was recovered with the cargo of fuel intact. Much of our time in those days was spent in clearing the beaches in preparation for the Mulberry Harbour. One day I listened to the shouting of some soldiers disembarking from a Landing Ship Infantry and the accents sounded all too familiar to my ears. They were Welsh and to my ears they came from the mining valleys ! As they moved up the beach I recognised someone from Treharris… I thought I was dreaming as they passed the word back to the Landing Craft. “Tell Fred his brother Bill is up here on the beach!” Fred came running as fast as he could, closely followed by Sergeant Willie O’Neill, who happened to live across the street from us in Webster Street. We stood there staring at each other for ages trying to accept this improbable meeting and were surrounded by others from Treharris. The Morris tribe were seven children that had survived infancy, my mother having given birth to a total of thirteen. 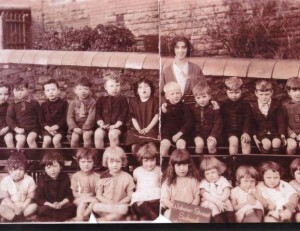 Two girls, Evelyn and Olwen and five boys, Tom, Fred, Ivor, Bill and Glyn. The mining towns of South Wales had endured the full force of the Depression and General Strike of the 1920s and 1930s. 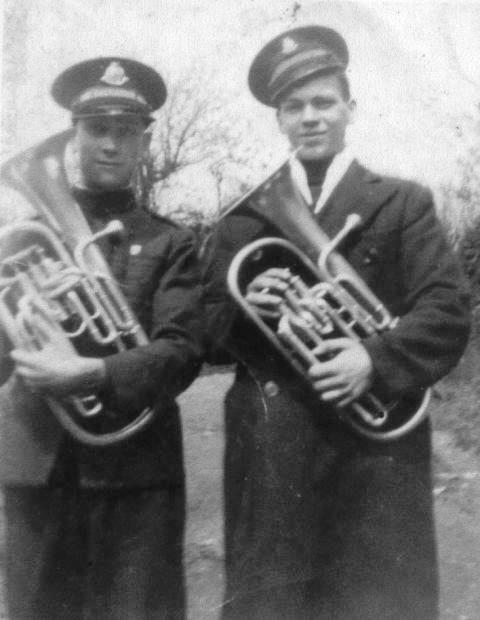 Four of us boys played brass instruments in the Salvation Army Band, namely Fred, Ivor, Bill and Glyn. A little further up the road was the Territorial Hall that offered two weeks holiday, under canvas, to any boys who joined the Unit of the Territorial Army. Many did join along with Fred and Tom, (Tom being the eldest boy of the family). They were all called up in 1939 and some served with the 5th Welch Regiment. Later on Tom returned to work in the coalmine. Fred’s talent on the trombone was soon recognised and he became a member of the 5th Welch Regimental Band. Part of his duties when on active service meant that he was a medical orderly and stretcher bearer. Fred was 23 years of age and I was 19 years of age at our momentous meeting in Normandy. I don’t know how long we stood there but at last an officer of the regiment came up to us with a friendly smile and said, “There is a war going on up the road and we should move on”. It was well known that there was strong resistance at Caen from the Germans and that is where the Regiment were heading. Within a few days I received a letter that Fred had returned to a hospital in England with multiple shrapnel wounds and that Willie O’Neill had been killed in action. Myself and Bill got in touch and he graciously sent me a copy of his wonderful book “More value than many sparrows” He also said that if anyone wants to purchase the book he can arrange it at a discount price of £10 to include postage and packing if ordered through him…just leave a message on here and I will supply Bill’s contact details. When did you move to Treharris, which street did you live in and how many of you lived in the house? Fred, Ivor, Billy and Glyn. We moved from Treforest to Webster Street where Ronnie was born. Ronnie died at around one year shortly after us arriving in Treharris. What was Webster Street like, the houses, the people? Webster Street was owned by the Deep Navigation Colliery to house the miners attracted to the Valleys in the Industrial Revolution. There were 82 houses which were numbered consecutively. Number one started at what we called Top Webster on the side nearest to the mountain. The Salvation Army was a Victorian Building before number one. At number 15 the terraced houses ended because there was an intersected road leading down to Fox Street. At that point Bottom Webster began we lived in the third house down at No.18. It was almost racial discrimination because we of Bottom Webster were considered inferior to those at the other end of the Street. Mrs Roberts lived in number 16 and we often played handball on her flank wall. Handball was played with a tennis ball using the palm of the hand as if it was a racquet. A line was drawn about one metre high on the wall with a piece of chalk. This served as a tennis net and your opponent would follow your hit, allowing the ball to bounce once. Mrs Roberts stayed indoors most of the time and rarely grumbled at our games. Next door to Mrs Roberts was the Evans family and then our house. The house was built of stone and slate roof. The front door was usually on the latch for anyone to walk inside. The narrow passageway lead to the front room on the left. This was our Holy of Holies and seldom in use except for very special visitors or open on Christmas Day. There was an old Singer sewing machine on a stand which folded down when not in use and a board was placed upon it so that it served as a table. When my brother Ronnie died we laid him out on that table so that friends could come in to see him before his burial. The back room was further along the passageway again to the left and this is where we lived and ate. With a large family the room was more like a Doctor’s waiting room with chairs all around. One large wooden chair with arms was for my father. The centre of the room was dominated by a a large farmhouse table. The fire place contained a large black leaded stove which was forever burning even on the hottest of days. The coal miners regularly received a load of coal which was dumped in the road outside and then carted by the family into the back yard so you see we were duty bound to burn the coal non stop! Over the fire place were two mirrors with hand painted roses on the glass. On one wall was a sepia photo of my father in soldier’s uniform and on the opposite wall was a large sepia picture of my Uncle Will in uniform. I was named after my uncle Will who had died in the trenches in France. In the scullery was a water pipe with a brass tap which leaked for want of a new washer. A small table was used to prepare food and the flagstones were always soaking wet from the dripping tap. Outside was the yard and in the far corner was the WC, no flushing toilets in our day. The houses were built at the foot of the mountain so we had about a dozen steps to climb to our garden which was level with our roof. Upstairs were three bedrooms, the first being my parents room the next being the girl’s bedroom and then the boy’s bedroom. Tom slept on a camp bed but Fred and Ivor slept at the top with Glyn and me sleeping at the bottom. It was not unusual to wake up with someone’s foot in the face. From my childhood the lasting memory is how much love there was between the many children and the adults. Everyone spoke kindly to the children and we were welcomed into the houses as if we belonged to the family. As a child did you play in the surrounding streets, there were plenty of shops in Treharris itself but can you remember the little shops that were in the front rooms of the houses, or the people than run them? Webster Street was full of children in those days and we made up our games amongst ourselves. Sometimes our boys would pick a quarrel with Fell Street mob and there would be stone-throwing but it was only a local skirmish. 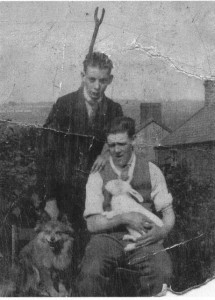 Glyn was eighteen months my junior and right from an early age we teamed up with Will and Dai Davies who lived in Top Webster at No 7. Will and Dai are still alive and we are still in touch by phone and letters. We used to go around the other streets and knock on doors before runnimg away. We took turns to knock on the door and one day we went to knock on the door of one of the teachers in Webster Street School. Her nickname was (Screecher Jones because of the way that she screamed at the pupils). Miss Jones lived in Penn Street. It was Glyn’s turn to knock on the door but sadly she was waiting for us with her yapping Pekinese. She grabbed Glyn and took him indoors while we ran away. It was the end of that game! My favourite shop was Tom Richards shop in his front room opposite Mrs. Roberts, the first house in Bottom Webster Street. Tom’s shop was always my favourite from my childhood until I left Treharris at the end of WW2. It was the meeting place for all the children and adults. Tom also had a milk round with a horse and cart and for some time I was his unpaid assistant. The horse and cart were kept near the Darren and we loaded up the cart with huge milk churns. We started our round in Treharris and served the customers as we ladled milk into their own jugs. The round was through Treharris to Edwardsville, on to Merthyr Vale and finishing at Abervan. I noticed as we went on to Edwardsville that we would stop at some public houses and Tom would take a large milk jug from the cart and go to the back of the pub. This happened at a Merthyr Vale pub, called I believe, the ‘Black Lion’. One day I was reading the Merthyr Express and the headlines were ‘Milkman fined for selling watered-down milk to customers’. I am pleased to tell you that the assistant was not mentioned! Glyn and me were appointed as ice makers in Tom’s garage. There was an old fashioned steel container with two paddles. Tom placed the mixture in the container and we would take turns at turning the paddles which seemed like hours of slave labour. Our reward was to lick the paddles clean at the end! Tom carried groceries, sweets, toys, household cleaning materials. We were allowed credit at Tom’s shop and I well remember going in for two ounces of butter ‘on tick’. Webster Street School…can you remember any of the pupils, or teacher’s names, which school did you go to after leaving there? Webster Street School was directly behind our house so it was only minutes away. I am still in touch with some of the pupils after all these years. A very good classmate of mine is Nance Watkins (Williams) who lives in Edwardsville, then there is Janet Davies (Martin) living in Ynysybwl, Idwal Lloyd, Marion Underdown (Evans) both living in Webster Street. My sister in law Kathleen Morris (O’Neil) lives in Williams Terrace. My first teacher was Mrs Gains and she was like a mother to us. I have already mentioned Miss Jones and then there was the Headmaster was Mr Lewis. My next school was Treharris Central School for Boys in Edward Street. What did children do in the area aged 4-14? Did you play further afield that the top streets, i.e. Trelewis, Edwardsville etc. ? The Park was our favourite place for playing and our minds ran riot as we jumped on the WW1 cannons to make war with the Germans. We would all take up positions and orders were given to fire. The Welsh always won the wars! If we felt hungry we would search the rubbish bins for orange peel and eat all of it! The park keeper was known as Parky and chased us away every time he saw us. in the street we played with cigarette cards, flicking them against a wall and the nearest won all the cards. We played in the gutter with glass marbles. When I was quite small I used to run away from home and usually ended up at my Aunt Martha’s home at 51 Norton Road, Cilfynned. She would reward we with a huge piece of fruit cake. The police station was next door to her house and I suppose she arranged for them to phone Treharris Police station. My brother Fred would cycle down to collect me on his crossbar but he never once reprimanded me. Later on I used to take Glyn, Will and Dai Davies down to Ponty and we would call on Auntie Martha for refreshments on the way. Saturday morning was a trip to the Palace Cinema in the Square. We had a plan that two of us paid the entrance fee and went straight to the toilets. Beyond the toilets was an exit door with a push bar. The rest of our party was outside so the door was opened sufficiently for our friends to enter but no one else because it was unfair to the management! When we were quite young Glyn and I played with Will and Dai Davies and often visited Trelewis on a Sunday evening to attend a welsh chapel that had I think a tin roof. We went to the evening service and sat in the front row. Our knowledge of Welsh was sparse but we joined in the singing with too much gusto and often drowned out the rest of the congregation. People used to say how good we were at singing in Welsh but it was more out of pity than anything else! There was a family living in Nelson who belonged to the Salvation Army and we used to visit the children at home. On one occasion we were returning from Nelson and just before we reached Trelewis we saw a shop with a table out side and on the table was a large tin of cream biscuits. We grabbed the tin and ran until we were well away before opening the tin which had a display of biscuits in the glass topped tin but nothing inside. Those in the lid were years old and stale so we threw the lot away! 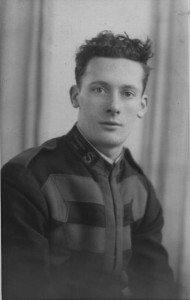 I remember George, Cyril and Marion Knott and I am still in touch with Cyril who moved to Hereford in the early 1940s. Edwardsville was always a favourite with the children of Webster Street because of the open air swimming pool and a visit to Beechgrove Cemetery as always on our list. To make some extra money we would go up to the mountain during the season to collect whimberries. It was back-breaking and received only coppers for an hour of work so that ended soon. Sometimes we would go on to the waste coal tips to fill a bag and sell it. Other times we climbed on to the coal trucks and helped some of the loaded trucks to lose some very large lumps. These helped us to fill the sacks quickly. Did you join The Salvation Army in Treharris, exactly where were they based because there is no sign of them in Webster Street today, how did they raise funds. Did they teach children to play instruments, who were the main people involved, where did they march, was it only Treharris, or did they get to the surrounding villages? You were puzzled because there is no sign of the Salvation Army Chapel in Webster Street today and you are perfectly correct because the building had been demolished in June 1978. The Salvation Army sold the site and purchased the premises previously occupied by Cooperative Department Store in Perrott Street. The old site at the top of Webster Street was sold and a bungalow put in its place. I was last in Treharris for the funeral of Bandmaster Fred Willetts. Fred had been the bandmaster for over 50 Years and the family invited me to speak at his funeral as his lifelong friend. Fred joined the Band when he was about 8 years old. He played cornet and sat next to me on Sunday morning for the meeting. Fred would fall asleep during the sermon and lean his head on my shoulder. He would wake up with a start when we began to play the closing hymn! At that time I was about 13 years of age. The service took place in the Tabernacle Chapel on Saturday 1 September 2007. So many people wanted to attend from all over the land bringing the total number to around 300 persons. I have avoided visiting the site in Webster Street for years because I feel so sad that the building was demolished. Yes, I did join the Salvation Army as a junior and then joined the senior band. My first visit to the Army is clear in my mind because my sister Evelyn was to be married one year later to James Starkey who lived at number ten Webster Street. From that first visit when I was but four years old I knew that I was going to belong for many years to those lovely people who were my neighbours. The Salvation Army funding came from the poor people themselves who were members, as well as from collections in the streets and by selling the ‘War Cry’ in the pubs and drinking clubs around Treharris. The Army was highly regarded in Treharris and well supported. The gang of four comprising Glyn, Will, Dai Davies and Billy joined the junior band when I was about nine years old. We were taught to play by Ted Barnes who was Deputy Bandmaster at the time. Ted played the trombone and lived at Cilhaul where we would go to his house to practice. My brother in law Jim Starkey lived with Evelyn in a lovely cottage in Quakers Yard at that time and Glyn and I would go there to be given extra tuition by Jim. Both Ted and Jim would stand behind us and beat out the tune with an old leg of a chair. After a year or so we joined the senior band. You have a photo of the senior band taken around 1927 but this was taken about seven years before we joined them. We marched around all the streets of Treharris and the surrounding villages. Leaving school and starting work, what jobs did you have before the war? 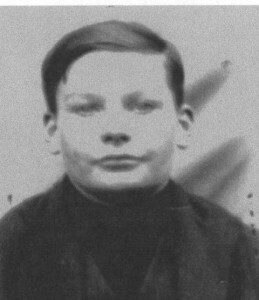 I left school at fourteen years of age in 1938 and the family agreed that I should try to find employment other than in the coalmine. 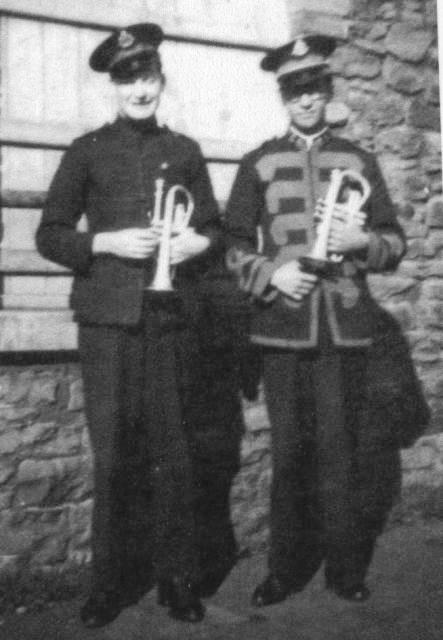 Evelyn and Jim were living at Llandenny where Jim was employed on the GWR as a signalman. They lived in a farm cottage in the grounds of a farm. Mr Evans told me that he knew a young farmer who wanted a farm hand near Raglan. I took the job and lived in for one week only. The farmer was newly married and I was not welcomed in the family home by his wife so I left. I still wanted farm work and replied to an advert for work at Laugharne. The employer was a barrister and the farm was a large manor house up a Long driveway with five house staff and me. I worked with a farm manager and we got on well but after about two months I decided that farm life was not for me. At that time Dylan Thomas was living in the village with his wife and writing some of his works that are still read throughout the world. Dylan Thomas was ten years my senior. Deep Navigation, the pit pond, the colliery itself.What are your memories? The magnet of the Deep Navigation Colliery was about to draw me into its net! It was decided that I would work beside Fred in No 2 Pit. Fred worked with a ‘Buttie’ called Tom Jones who lived in Edward Street. That first day was a terrible experience for me, the cage door closed; we were in free fall that juddered to the pit bottom. We then had a long walk, carrying a cumbersome lamp in one hand and a water container, acting as a shield for the person walking behind me. My Tommy box of food was in my other hand. The long trudge ended when I saw before me the gleaming coal face of black gold. My feeling was of being locked in this blackness all day and then to come up into a blinding light which we call sunshine! Most of my school friends were down in the pit with me and there was a wonderful feeling of comradeship amongst the men and boys. After the shift one of my friends suggested that we go to the billiard hall where we played a game but my mind was not there. It was facing the fact that tomorrow would be exactly the same as today! The pit pond was where I learned to swim after almost drowning in the Pandy. My brother Ivor took Glyn and I for a walk around the Pandy one Sunday afternoon. It was out of bounds to us because I was only about six years at the time. I took off one of my shoes and decided to float it as a boat in the water. The shoe started to sink so I reached forward to grab it but I overbalanced and fell in. The water was very deep and I struggled but drifted out towards the middle. It was summertime and people were up on the rocks sunbathing after their swim. Ivor kept shouting ‘Help’ but no one was listening. Eventually some man high up on the rocks heard his cry and dived in to save me. I never knew his name but after I had left home for the Navy years later Ivor found out that he lived in Bedlinog and went to his house to thank him for saving his brother Billy from drowning. The episode caused the older boys in Webster Street to teach us to swim in the pit pond! The pond was the last resting place for our domestic pets so we were in good company! We youngsters were thrown in and had to find our way back to the bank by swimming. If anyone got into difficulties the others would rescue us, after a while. Trelewis, Edwardsville, Quakers Yard, Bedlinog and Nelson… what memories have you of these villages? I have many memories of all the surrounding villages because when we were young the four boys used home as a place to eat and sleep. Otherwise we were on the march far away or close to home. Trelewis has happy memories because often we would sit on the mountain behind Webster Street in the summer and look across towards Trelewis. My father had been a Foreman Builder there when some of the new houses were built but we made up our own stories about that terrible place. We called it Stormtown because all of our bad weather came from Trelewis as well as all the bad luck we suffered in our lives. We thought that the inhabitants came from outer space and one day would take over our town. The four used to visit the chapels at Trelewis on Sunday evenings and we loved the tin chapel where they sung hymns in Welsh. We were so loud and guessed at some of the Welsh words that the rest of the congregation didn’t stand a chance! Edwardsville was another haunt of ours. On Christmas Day the Salvation Army Band would march around all the Treharris streets ending up outside Beechgrove Cemetery. Our Bandmaster was Will Edwards and although he was a fine musician he was not a child psychologist. On Christmas morning the Band would meet in Webster Street at 9 o’clock in the morning to march around and wake everybody up! It was usually so cold that the valves on the instruments would freeze and we needed to use our breath on the valves to release them. Youngster would join us to sing the carols with the new toys in most streets. We played up quite a lot and Will Edwards would ask us to behave and if we were good one Christmas Day he promised us children a present at the end so we were on our best behaviour. He opened his briefcase at Beechgrove and gave us each two fingers of Kit Kat chocolate! On Easter Day we four used to visit Beechgrove Cemetery in our Salvation Army uniforms and walk around to the graves that had no daffodils. We would collect a few from each grave that had many flowers and share them out until an official came and chased us away! 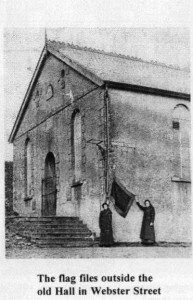 Between the wars, Bedlinog was known in Treharris, as ‘Little Moscow’ because it was felt so many of the people were communists. 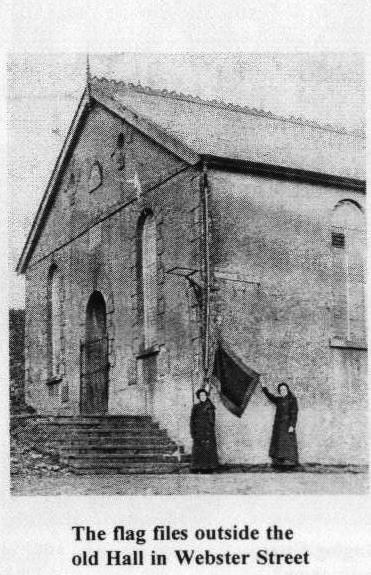 There was in Forest Road, Treharris a Pentecostal Church and sometimes the four would attend the meeting on Sunday evening as a change from the Salvation Army. One week they held a mission and were helped by the members of the Pentecostal Church at Bedlinog. There were a number of pretty girls about our age came down from Bedlinog to help with the mission. We used to help at the mission because we fancied the girls but when the mission ended so did the girls and so did we! Nelson was a favourite place of the four because we went to the cinema there sometimes. The Knott family lived there and we used to call in to see them. I remember the handball pitch in the centre of Nelson which was used regularly by visiting teams. What was The Treharris reaction to the war, people and friends leaving, obviously a lot of Treharris men were required to stay behind to work in the pits, it must have been a worrying time? The war meant that things in Treharris would never be the same again. War was declared on Sunday 3 September 1939. The news was given to me by Tom Richards in the shop in Webster Street. Whatever we needed was purchased on the day rather than storing foodstuffs as we do today. A fridge was considered to be the luxury of the rich and famous in the land. I had just come home from the Salvation Army hall at about 12.15 and Tom’s shop was always the centre of news information. Olwen asked me to go across to the shop for gravy browning for the Sunday lunch. Tom announced to me that war had been declared between Britain and Germany. The very news came with a wave of excitement to my mind but I was to learn from experience the horror of war. The Territorial Drill Hall was along a lane beyond the Salvation Army and many of the boys in Treharris were peacetime Territorial’s. The attraction was a free holiday as Territorial’s when very few of the boys could ever hope to have a holiday any other way. My brothers Tom and Fred belonged and they were soon called up for duty with the 5th Welch Regiment. Although mining was essential work the Terriers were needed as a front line of defence. Many of the older people in Treharris had already lived through the First World War and now they were watching preparations for another war! There was much weeping as the soldiers left the Drill Hall without knowing their destination. One of the boys phoned home that night to announce that they had only gone to Bridgend where they would be staying for some time. Tom worked the Dump at the pit and he was allowed to return home for essential work. There was a lot of reorganisation at the pit with so many young men gone to war. I worked with my new ‘Buttie’ Roy Williams. Roy was in his mid twenties and we got on well together. Friday was payday and Roy used to take me to ‘Conti’s’ cafe in Fox Street where he paid me my wages and treated me to a hot Vimto. Mr Conti had brought his family from Italy after WW1 and had settled down amongst the community. I always found him to be a gentleman who was kind and considerate to his clients. Because he was a foreign national he was considered be a threat to security and so he was put on a ship with other detainees bound for Canada. The ship was torpedoed in the Atlantic and 805 lives were lost which included Mr Conti. Parliament decided that in future all detainees would be kept in the United Kingdom but it was a bitter blow to Treharris. The black early days of the war with all the bombings of the cities and the fall of France to Germany will always remain with me. Paul: Did you return to Treharris after the war to live, have you visited over the years, what have you observed? In September 1946 I returned from the Far East on the Merchant Navy Troopship having left my ship at Singapore. I was given early release from the Royal Navy because I was to enter the Salvation Army College at Demark Hill in London for training prior to being commissioned as a Salvation Army officer. I was demobbed in early October and was a late arrival at the college. I left home then but Treharris will always be home to me. Over the years I have visited my family but infrequently of late because my brothers and sisters have all died. I still have relatives living in Treharris. 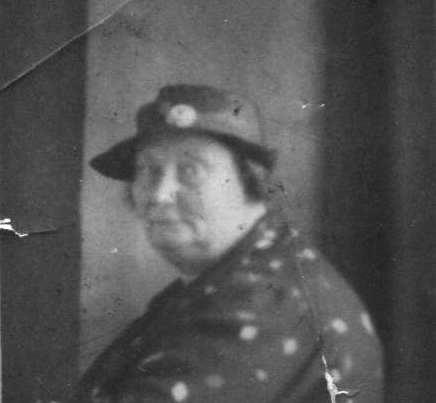 Kathleen Morris, my brother Fred’s wife lives in Williams Terrace, Olwen’s son lives in our old house in Webster Street, Tommy’s son Graham and his wife live in Fell Street, David Starkey, Evelyn’s son lives in Edward Street. I am saddened when I see that many fine old buildings have been demolished. My lovely Salvation Army in Webster Street was replaced by a bungalow; The Square no longer exists as I knew it. The Palace cinema was demolished to be replaced by a grassy slope. I have no way of knowing who is responsible for these alterations but it does nothing for the spirit of old Treharris. Although I have not seen the destruction to the buildings that existed in Cardiff Road I am told that the carnage goes on! The greatest sadness that I have is to see how people have lost much of the fire and fight which was evident between the wars and during WW2. If only that fire and fight could be revived I have hope for my home town even today.